New data from New York DOH unveil mortality rates for cardiac surgery by hospitals and by type of procedure. Even though some procedures are by nature riskier than others, New Yorkers suffering from heart conditions should understand that not every hospital offers the same level of safety. Valve surgery is the riskiest type of cardiac surgery with a mortality rate of 4.59% for New York State between 2008 and 2010. PCI or Percutaneous Coronary Intervention, sometimes also called coronary angioplasty or coronary stenting is the less risky of all types of cardiac surgeries as long as it is a planned surgery. It becomes riskier when it is an emergency procedure. In 2010 the safest hospital to have a PCI was Cayuga Medical Center in Itaqua. Cayuga Medical Center only treated 19 patients but it is the only hospital to have a 100% survival rate for planned and emergency PCIs. 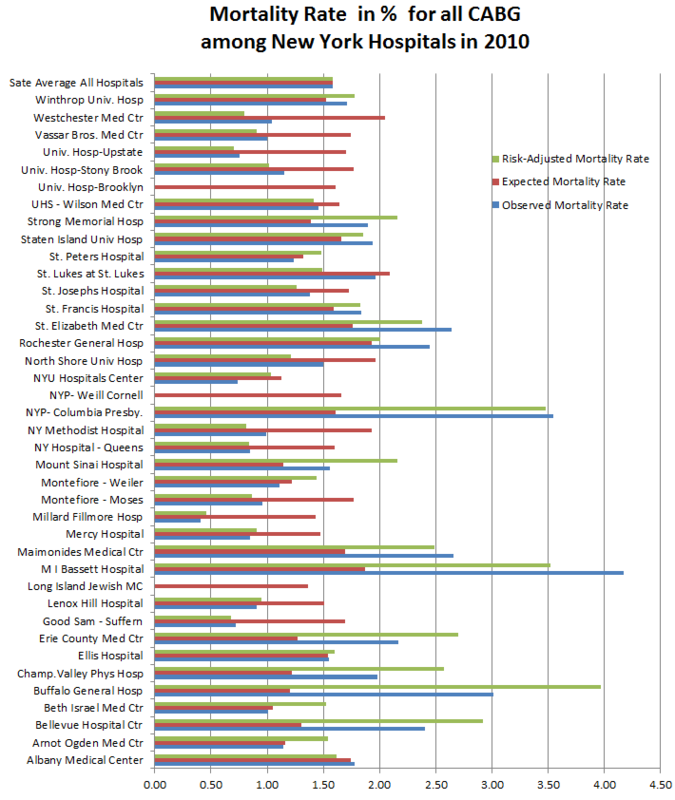 Among the worst performers, Upstate University Hospital in Syracuse lost 7 out 236 patients while performing PCI, the Concourse division of the Bronx-Lebanon Hospital lost 4 out of 65, White Plain Hospital in New Rochelle 4 out of 130, Faxton St Lukes in Utica 5 out of 286 and Montefiore Weiler in the Bronx lost 14 patients out of 640 cases. These 5 hospitals have a risk adjusted mortality rate of 2% and above while the average mortality rate for all PCI for the State of New York comes to 0.84%. Looking at non emergency PCI only (the safest type of cardiac surgery with an average mortality rate of 0,51% for the Sate of New York), the Huntington Hospital has a mortality rate above 2%. The statistical relevance of this number is somewhat questionable however as the hospital recorded one case of death out of 48 non emergency PCIs. Statistics over several years would be more appropriate and accurate for hospitals with a small number of cases. Unfortunately these statistics were not provided by the DOH for non emergency PCI. 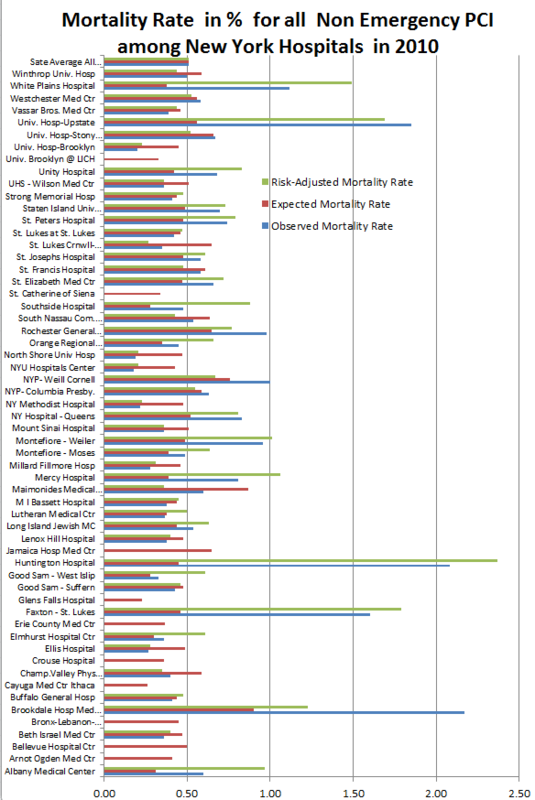 Faxton St Lukes and Upstate University Hospital performed poorly with a risk adjusted mortality rate of respectively 1.79% an 1.69%. The best hospitals to have a planned Percutaneous Coronary Intervention in 2010 were the University Hospital of Brooklyn at Long Island College Hospital, St Catherine of Siena, Jamaica Hospital, Glens Falls Hospital, Erie County Medical Center, Crouse Hospital, Cayuga Medical Center, Bellevue Hospital, Arnot Ogden Medical Center and the Concourse division of the Bronx-Lebanon Hospital. 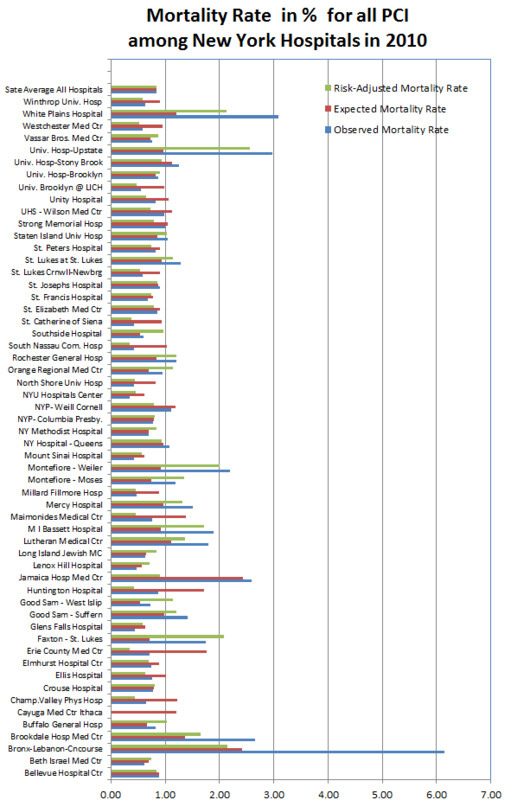 All these hospitals had 100% survival rate for non emergency PCI. The Concourse division of the Bronx-Lebanon Hospital had 5 planned PCIs and 60 emergency PCIs in 2010. 4 patients lost their lives during emergency PCI while all those undergoing planned PCI survived. This explains the big difference between the previous graph and this one for this hospital. The DOH provided emergency PCI statistics covering the years from 2008 to 2010. New York State Average Mortality rate stood at 3.17 % for this type of procedure over these years. Even though it had only 4 cases over 3 years, Cayuga Medical Center is the only hospital that achieved a 100% survival rate. 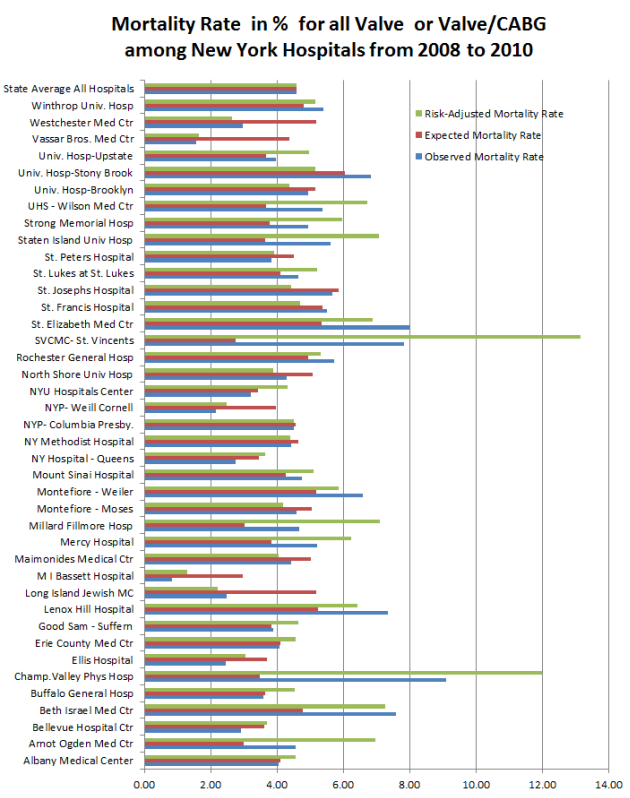 Among the safest hospitals, St Catherine of Siena, Hunington Hospital, Maimonide Medical Center, Champlain Valley Physicians Hopsital, Elmhurst Hospital Center, North Shore University Hopsital, Vassar Bros. Medical Center and Millard Fillmore recorded a risk adjusted mortality rate below 2% for emergency PCI between 2008 and 2010. 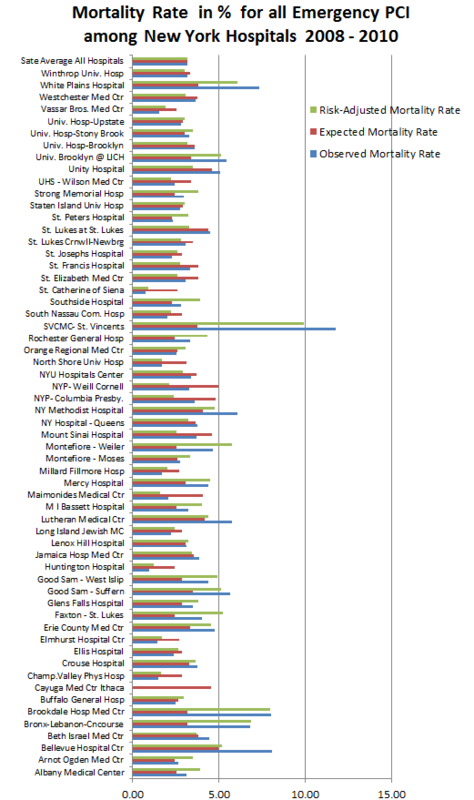 Among the riskiest hospitals for emergency CPI were Saint Vincent’s Catholic Medical Center (now closed), Brookdale Hospital, Bronx-Lebanon Concourse, White Plain Hospital, Faxton – St Luke’s, Bellevue Hospital, Good Sam and University Hospital of Brooklyn at Long Island College Hospital. All these hospitals lost too many patients during emergency PCI with a risk adjusted mortality rate over 5% and reaching even 9.91% for St Vincents. All patients undergoing Coronary Artery Bypass Graft surgery (CABG) at the University Hospital of Brooklyn, New York Presbyterian – Weill Cornell Medical Center and Long Island Jewish Medical Center survived in 2010. 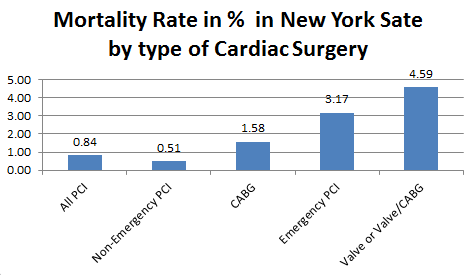 The average mortality rate for CABG for the Sate of New York in 2010 was of 1.57%. Well above this average and among the riskiest hospital to have a CABG were Buffalo General Hospital with 11 deaths out of 366 cases , New York Presbyterian – Columbia Presbyterian (11 deaths out of 310 cases) and the Mary Imogene Bassett Hospital in Cooperstown with (3 deaths out of 72 cases). Valve related surgery is the riskiest of all cardiac surgeries with an average mortality rate of 4.59% for the State of New York between 2008 and 2010. The Vassar Brothers Medical Center in New Rochelle, the Long Island Jewish Medical Center, The New York Presbyterian-Weill Cornell in Manhattan, the Westchester Medical Center and the MI Basset Hospital outperformed their peers with a risk adjusted mortality rate below 3%. Among the worst performers were Beth Israel Medical Center, Champlain Valley Physicians Hospital and St Vincents.